The Fori Imperiali station extends beneath the Via dei Fori Imperiali, in the area between the Colosseum (Flavian Amphitheatre) and the area in front of the Basilica of Maxentius. Inserted into a construction dug between diaphragm walls, the station has a plan width ranging between about 30 and 50 metres, and a total length of approximately 240 m.
The construction reaches a depth of 32 m below ground level, and is organised in five levels: the lobby level, having a total surface exceeding 6,100 m2, which also permits connection with the Line B platforms by means of a mezzanine level; two levels dedicated to equipment rooms, covering an area of about 3,900 m2 each; a platforms level, and an under-platforms level. 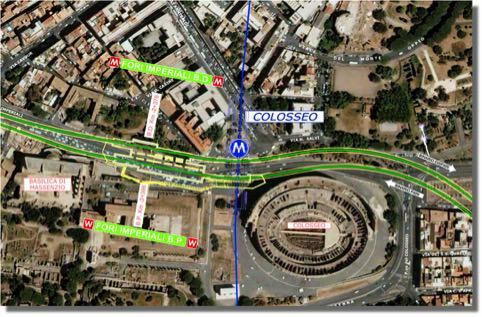 The Fori Imperiali station’s functional scheme is with central platform 110 m in length, and 4.00 m wide. For the passengers’ safety, the adoption of the automatic driverless train system requires equipping the platform with a system of automatic screen doors in glass and steel, opened and closed synchronously with the train doors. The entrances to the two Lines B and C remain separate, while the underground connection to the Colosseo station takes place through a lobby-level walkway that arrives directly at the Termini-bound Line B platform, and through a mezzanine-level walkway that reaches the other platform, crossing the tracks by means of a pedestrian link passing over the existing station underground. 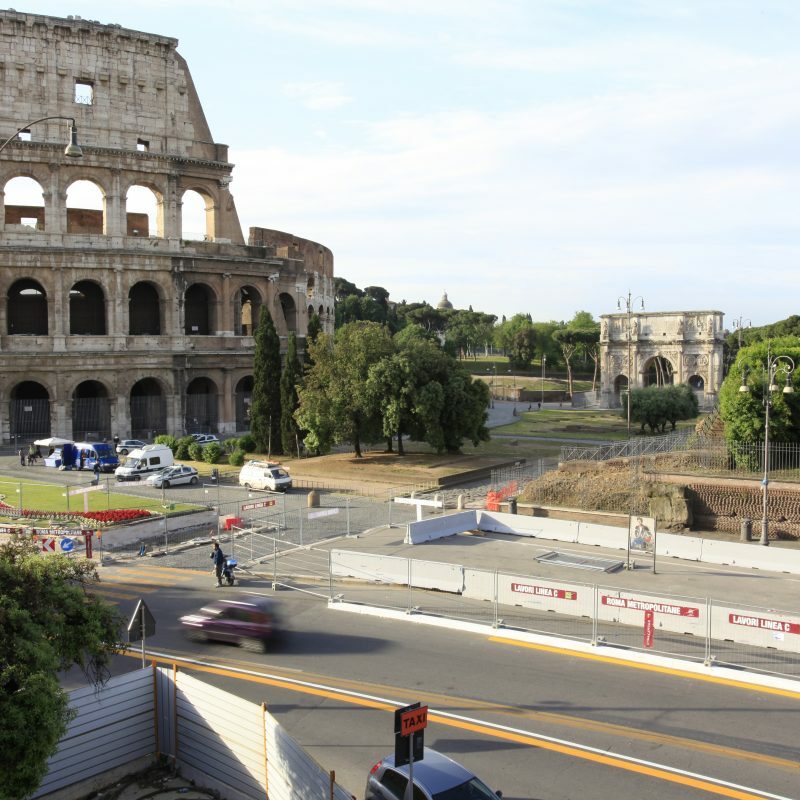 There are two station entrances, placed respectively one per side on Via dei Fori Imperiali. Each entrance is equipped with a pair of lifts, and with a system of staircases and two escalators. The connection with the Line C platform level takes place through a single large stairway unit, equipped with entwined staircases and escalators, placed at the centre of the lobby level. The station’s excavation was designed limiting interference with surface roads to a minimum. Once the perimeter diaphragm walls and the covering slab were made, by alternating the traffic phases, the work site reduced in size, continuing with top-down construction. This excavation method consists of building slabs from top to bottom, with casting against the ground, which makes it possible to counter the perimeter diaphragm walls starting from the excavation phase.